The Styrofoam shapes are covered in Korean mulberry paper. In Korea, the paper is a mainstay and has many utilitarian uses from floor and window coverings to candy and medicinal wrappers. It also resonates with personal meaning for the artist, who recalls trips to an herbalist as a small child. Medicines wrapped in mulberry paper hung from the ceiling of the shop, the paper protecting the contents from dampness and insects. Kwang-Young Chun (Korean, b. 1944) makes intricate sculpture out of the recycled pages of old Korean books and medicine wrappers printed on mulberry paper. He wraps the handmade paperinscribed with Korean characters around thousands of Styrofoam tetrahedrons and other geometric forms that serve as the basic units of his compositions. The forms are then arranged in free-standing three-dimensional sculptures or mounted on the wall as two-dimensional low-reliefs. Korean artist Kwang-Young Chun (b. 1944) began work on his series of Aggregations in the 1990s. Today, he is recognized internationally for these sculptural forms. The basis of his work is individual, triangular, Styrofoam shapes. Individually, these shapes are minuscule. Taken together, however, their visual impact is immense. 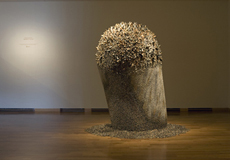 This concept of the aggregate is what informs Chun's work. Chun uses pages recycled from old books to cover the geometric forms. These pages are covered in Korean and Chinese characters, adding another layer of cultural and personal meaning. He hand ties the paper over each shape, twisting pages into string to complete the wrapping. In this way Chun is able to integrate traditional materials into a contemporary context. After starting his artistic career studying western painting, in particular Abstract Expressionism, Chun turned to the mulberry paper as a way to express his unique, Korean artistic voice. The papers, taken from books that are often as old as one hundred years, have been touched by people from all walks of life. Over the years, these people men and women, young and old have left indelible fingerprints. Chun captures the spirit of these people and their varied voices in his series of Aggregations. Aggregation 08-AU022 is Chun's largest sculptural work to date and measures almost fourteen feet high. It premiered at the Aldrich Museum of Contemporary Art, Ridgefield, Connecticut, earlier this year. The sculpture gives the overall appearance of being monolithic, yet upon closer inspection the intricacies of material, shape, shade, and hue become apparent. 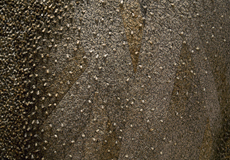 Similarly, the wall reliefs included in this exhibition are an examination of texture and shape. The individual pieces come together to create surfaces that resemble topographies and landscapes. Separately, they appear organic in shape, resembling crystals or rocks. 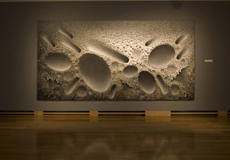 The surfaces of the sculpture and the wall reliefs are irregular and highly textured, layered with meaning. Chun brings both the positive and the negative to his works. Dark, shadowed shapes give the appearance of a scar or wound, while lighter surfaces counterbalance these elements. His work is often influenced by historical or political events that have shaped people's lives and experiences. Subtle color is integrated into some of the wall pieces from natural dyes, which are often plant based. Chun dips the individual triangle shapes into the dye and the mulberry paper absorbs the color. The wall reliefs included in this exhibition have not previously been seen in the United States. Kwang-Young Chun received his BFA from Hong-Ik University, Seoul, and his MFA from the Philadelphia College of Art. His work has been exhibited extensively on an international level, including in Moscow, Singapore and Paris. The National Museum of Contemporary Art in Korea named him Artist of the Year in 2001 and he is represented by Robert Miller Gallery, New York. Funded in part by the National Advisory Board of the UW Art Museum and the Wyoming Arts Council through the National Endowment for the Arts and the Wyoming State Legislature.